Topping our list is this Springboard Intermediate Data Science training course. The course that has so far enrolled about 800 students has one of the highest ratings at 4.88/5! Raj Bandyopadhyay, the course instructor will ensure that you go beyond just mastering skills such as statistics, visualization and data wrangling. You’ll learn how to become a machine learning expert. The areas covered by the course include advanced forms of data science concepts such as machine learning as well as inferential statistics. You’ll also obtain practical mastery in building data products which can integrate with various product-grade based software. This data science course has been recommended by industry practitioners as one of the best because of what it delivers. Besides this, the course has so far enrolled 3475 learners with 1079 of them giving it a rating of 4.2/5! So what does this leading course cover? It trains you on how to master data science as well as analytics techniques while using Python. You’ll cover the essential concepts in Python programming. The course also delves into details of machine learning, data analytics, data visualization, NLP and web scraping. This is among the leading Data Science Programs that can never be ignored! This is demonstrated by a whopping 37,000+ learners satisfied by this course. And we won’t forget the 4.57/5 rating by 5000 of these students! The course allows you to learn the basics of Python as well as master major concepts of Python programming like file operations, data operations, and object-oriented programming. You’ll also come across a number of Python libraries that include Numpy, Pandas, and Matplotlib which are an essential aspect of Data Science. The Introduction to Data Science in Python Course from Coursera is without doubt such a great course. With a rating of 4.5/5 by 9,871 learners and 2,336 reviews, this course comes highly recommended! But why is this the case? This is because of how the course takes you through Python programming all the way from scratch. And that’s not all! This course is delivered by Christopher Brooks, a leading data science specialist. Through his guidance, you’ll master techniques like lambdas, how to read and manipulate csv files, as well as the details of numpy library. Some of the skills that you’ll gain from this Data Science tutorial include Python Programming, Numpy, Pandas, and Data Cleansing. This Pluralsight course is among the best Data Science with Python courses that will equip you with advanced knowledge to help you become a data scientist. This leading course has been rated at 4.9/5 by over 138 learners. With the help of Abishek Kumar, the expert course instructor, you’ll become experienced in working on data science projects that include processing of data, and how to build and evaluate machine learning models. Through the use of Python libraries, you’ll understand how to expose the ML model as a general API. Course Price: The monthly price is $29, while the annual price is $499. The annual price is a 14% saving. The premium package will cost you $499 annually. The other package available for this course is the Business Package divided into Professional at $579 per user annually, and Enterprise at $779 per user annually. This amazing Python for Data Science course qualifies as one of the best Data Science courses due to its unique features. It has been viewed by over 179,490 learners with 8920 of them approving it as the best. The course starts with basics of Jupyter notebooks, and takes you through data visualization, analysis, and machine learning and its methods. Other topics include data clustering, as well as classification methods, and how to create plot.ly charts, among other topics. Course Price: The Basic fee is $29.99 billed monthly, while the annual fee is $24.99 per month. You’ll save 14% when you opt for the annual package. 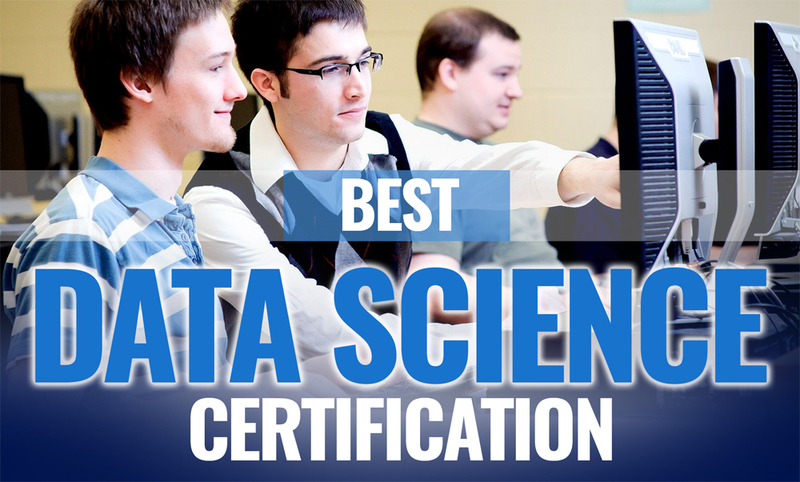 If you were still trying to figure out which Data Science Certification Online course to enrol in, then this list settles it all for you. You only have to pick the one that takes care of your training needs and goals. Data Science industry practitioners understand what it takes to become a professional data scientist. This is why they decided to analyze and compile these leading courses. Picking any of these Best Data Science courses will propel you and your career in a big way. The in-depth skills and experience and the ability to help your organization make the right business decisions come with choosing the right course. Beyond these aspects, you’ll also qualify for a great salary package that currently stands at around $127,637 per annum. This is according to Indeed. Start your journey to a successful data science career today and never look back!